Mangaluru, Aug 9: Supporters of MLC Ivan D’Souza and those of District Youth Congress president Mithun Rai clashed with one another just after the end of a party function at the Town Hall related to Quit India movement. 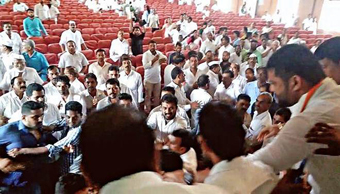 As the function ended, there was a heated exchange of words between Puneet Shetty, president of the Yuva INTUC, Dakshina Kannada unit, and Lawrence. Shetty reportedly questioned Lawrence over the latter posting on the social media a video related to him. Following the heated exchange of words, supporters of Lawrence rained blows on Shetty. Shetty and his supporters retaliated. This happened in front of the District Congress president Harish Kumar, the former Minister B. Ramanath Rai and Ivan D’Souza. Mr. D’Souza and other Congress leaders intervened and sent away the clashing party members. Shetty told reporters that he was assaulted by supporters of Mithun Rai. Shetty got himself admitted to a private hospital in Kuntikana. Earlier, Mr. Kumar, Mr. Rai and Mr. D’Souza took part in a rally from Tagore Park to mark the Quit India Day commemoration programme. Congress activists marched till the Town Hall for the function.